A magnetic filament on the sun erupted hurling inky-black fragments of itself into space. CME expected this week. Storm track models from NOAA suggest that the CME will deliver a glancing blow to Earth’s magnetic field on Nov. 18th or 19th. There is a 70% chance of polar geomagnetic storms when the CME arrives. Actually, the arrival of the CME could be the second strike. A co-rotating interaction region (CIR) is also expected to hit Earth’s magnetic field on Nov. 18th. CIRs are transition zones between fast- and slow-moving solar wind streams. Solar wind plasma piles up in these regions, producing density gradients and shock waves that do a good job of sparking auroras. 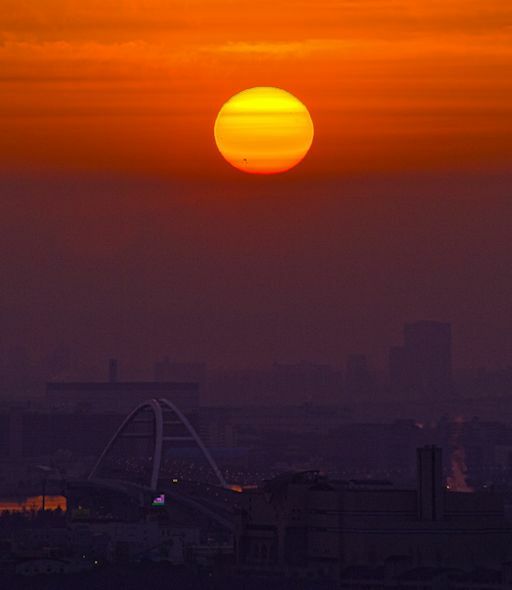 Let’s begin with the Sun. The Sun is the center of our Solar System, and all life that is on this Earth came from the Sun. If there were no Sun, we would not be alive. This is simply scientific fact. And so any changes that occur in or on the Sun will eventually affect every person alive. 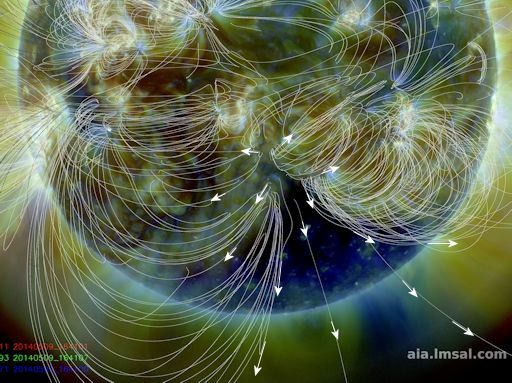 We know that the Sun’s magnetic field has changed in the last 100 years. There’s a study by Dr. Mike Lockwood from Rutherford Appleton National Laboratories, in California. Dr. Lockwood has been investigating the Sun, and reports that since 1901 the overall magnetic field of the Sun has become stronger by 130 percent. Earth: Substantial and obvious world-wide weather and geophysical changes. Earth’s Axis has changed. 400,000 Mile Long Solar Filament Release. The sun releashes an earth facing filament. CME ALERT. 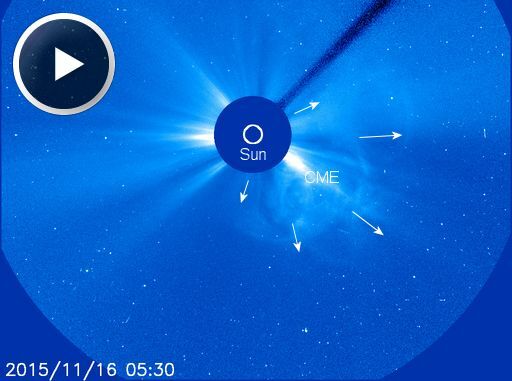 Because of its location on the sun’s western limb, the eruption did not send a CME toward Earth. However, there was an effect on our planet: Shortwave radio loudspeakers roared with static, an event called a Type II radio burst. 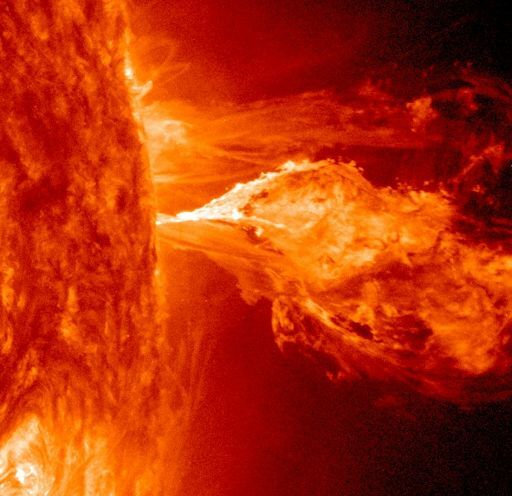 Here’s how it works: The explosion sent shock waves rippling through the sun’s atmosphere. Those shock waves, in turn, triggered plasma instabilities in the solar corona that emit strong radio emissions. 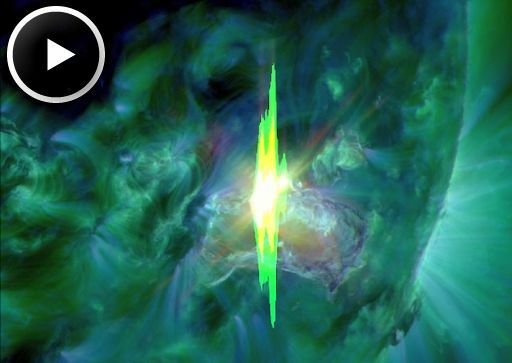 The static-y “roar” of the explosion was picked up by solar observatories and ham radio stations across the dayside of our planet. Based on the sweep of radio frequencies from 20 MHz to 500 MHz, analysts estimate a shock velocity of 776 km/s or 1.7 million mph. That may sound fast, but it is typical for this type of eruption. Scientists discovered three new planets orbiting stars in a cluster about 2,500 light years from Earth. Remarkably, among them they found an exoplanet orbiting a star which is almost identical to our own Sun in all respects. The fascinating find was made by astronomers from the Max Planck Institute for Extraterrestrial Physics in Germany. They have been monitoring 88 promising-looking stars in a formation called Messier 67 for the past six years. Messier 67 is a cluster of about 500 stars in the constellation of Cancer. The discovery is so exciting because it is the first time astronomers have found an exoplanet orbiting a star which is almost identical to our sun, in a cluster of stars. The star, similar to the sun in mass, temperature and chemical composition, was named YBP1194. 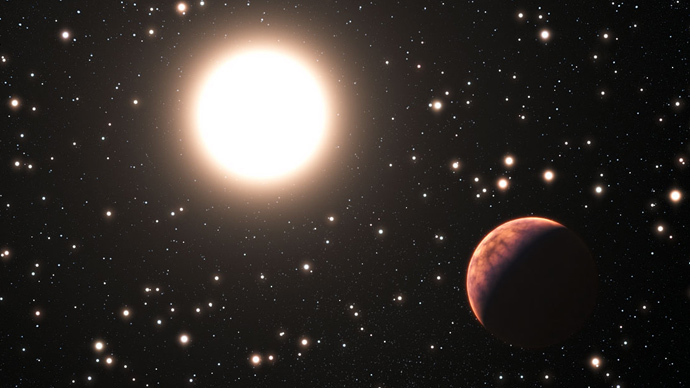 The second planet that was discovered is also orbiting a star similar to the Sun. The third one is circling a more massive and evolved red giant star. Aside: Look carefully at the full-sized picture. There is a red fringe on the bottom of the sun and a green fringe on top. That’s real. The colorful fringes are caused by refraction in Earth’s atmosphere. The effect is explained here. Although the sunspot has been relatively quiet and stable since it first appeared on New Year’s Day, a region of this size has the potential to produce significant activity. Indeed, NOAA forecasters, who say they are keeping a close eye on this behemoth, estimate a 75% chance of M-flares and a 30% chance of X-flares on Jan. 4th. 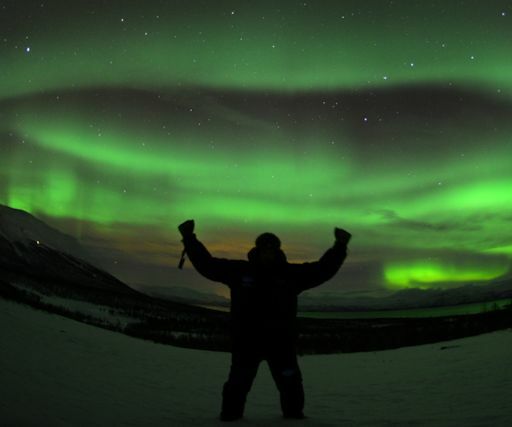 NOAA forecasters estimate a 20% chance of more polar geomagnetic storms on Jan. 4th as the solar wind continues to blow. The sun’s magnetic field is about to flip upside down as it reverses its polarity. In August Nasa said the reversal would happen in three to four months time, although that it would be impossible to pinpoint a more specific date. Solar physicist Todd Hoeksema from Stanford University said that the reversal would have “ripple effects” across the whole of the solar system. According to Nasa the sun’s magnetic field changes polarity approximately every 11 years. In comparison the last time the Earth’s magnetic field flipped was almost 800,000 years ago. When this happens the opposing magnetic poles switch places so the magnetic field is flipped. The pole reversal happens at the peak of each solar cycle as the sun’s “inner magnetic dynamo” reorganises itself. The exact internal mechanism that drives the magnetic shift is not yet entirely understood by researchers, although the sun’s magnetic field has been monitored on a daily basis by Scientists at Stanford’s Wilcox Solar Observatory. 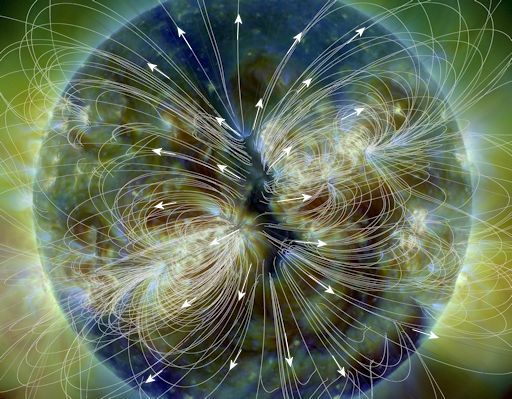 The sun’s magnetic field is poised to reverse its polarity. The effects of the event, which occurs every 11 years, will ripple throughout the solar system and be closely monitored by Stanford solar physicists. Sun Flips Poles! Sun’s Magnetic Field Reverses Polarity! The Cycle of flipping is complete. We are Now at the mid point of solar cycle 24. The pattern runs in 22 year cycles! Now, the magnetic fields will once again started moving in opposite directions to begin the completion of the 22 year long process which will culminate in the poles switching once again.